This morning of Saturday September 2, 2017, I’m trying hard to build energy and motivation to analyze another redline of our agreement for a land deal for a company my partners and I are building. I have a birthday party tonight, and tomorrow I have a Jodo Shu service and board meeting, a community event with my family, and my weekly Skype with my sister Mia and 2 young nieces, thus, I want to try to get it done in 3 to 4 hours today. I had about 7 hours of sleep, so to add to the energy I got from my sleep, early this morning, I exercised at 24 Hour Fitness in Mililani, Hawaii – weightlifting and running the treadmill. 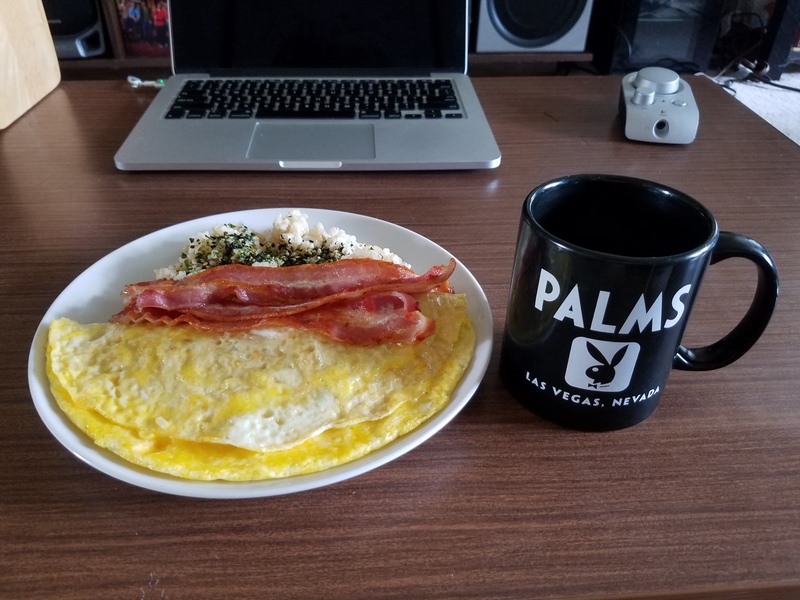 Then I cooked up some breakfast: bacon; omelette with 3 types of cheddar cheese, onion, bell pepper, and my homegrown green onions; brown rice with furikake; and Ka’u coffee. I keep telling myself for nearly 2 years on this project that the sweat, tears, and struggle will be worth it. I’m grateful to have this opportunity. Let’s go!! !